Update July 23: Telstra will also have the handset, and has announced that it will also have the LG G Watch from 5 August as well. The LG G3 will be available for pre-order from July 29 from Telstra, and the telco will be giving away a $250 VISA gift card with "select pre-orders". On a 24-month Accelerate Plan, the handset will come with a $7 monthly repayment. The LG G Watch will be available for $259 outright, or with a $10 per month fee on a 24-month Accessory Repayment Option plan with a $19 upfront payment. Harvey Norman customers who pre-order the LG G3 will be getting a 128GB microSD card valued at $289, with pre-orders ending August 3. Update July 22: Vodafone has announced that it will begin taking pre-orders beginning tomorrow, July 23 at 9am, which is when the website for registering your interest will be available. The telco has revealed that the LG G3 will be available for $0 on Vodafone's $70 Red plan. Going up against Optus' bonus offer, the first 1000 customers to pre-order the LG G3 through Vodafone will receive the LG G Watch, which, valued at $259, is one of the very first Google smartwatches to be announced. The anticipated LG G3 is all set to land in Australia on August 4, with Optus taking pre-orders from today, July 21. We've given the handset 4.5 stars, which sports a 5.5-inch 2560 x 1440 screen, a 2.46GHz quad-core processor, 2GB of RAM and a 13MP camera, complete with a fancy laser autofocus function. 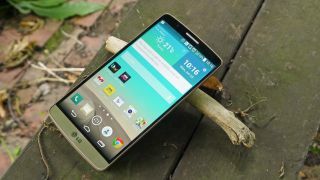 Optus will be selling the LG G3 outright for $696. You can also pick up the handset on a plan, with $5 repayments on a $60 My Plan Plus. Telstra and Vodafone have been quiet on the LG G3's availability, but we assume it'll be heading to the two competing telcos as well, along with Optus MVNO Virgin Mobile. LG has a couple of smart accessories lined up for the LG G3, including the windowed Quick Circle Cover and wireless charger. The cover, available in four colours, will come with a $49 price tag while the wireless charger will cost $69. Textured, rear snap on covers will also be available for $19. Optus will give the first 100 customers to register their interest in the G3 an LG G Pad 8.3 (valued at $399) and a wireless charging dock.